If you’re suffering from constipation, bloating, gas, lymph node swelling, lethargy, skin breakouts and persistent yeast infections or UTIs, today’s natural colon cleanse product, Colon Clean, may be for you. It uses casacara bark as an unusual and alternative main ingredient, and we will scrutinize how effective this is. Yeast infections and UTIs are additional, and not primary, symptoms of an obstructed colon so if those are your only symptoms, seek supplements that target those digestive issues as a stand-alone objective. Infrequent or inadequate movement of the colon and waste elimination is certainly a common complaint in the US. There are more recorded ER visits for colonic waste elimination than ever before. Processed, fiber-devoid diets have resulted in not only higher incidences of chronic constipation, but higher rates of IBS (as a factor, not cause) and diverticulosis. When waste is allowed to decay in the body, instead of outside it, it turns the body into a literal cesspool of bacteria-, fungi- and toxin-rich particles. Left unchecked, these eventually make their way into the bloodstream, causing the kidneys and liver to have to work extra hard to clean the life-giving blood going to the organs. The manufacturer says these ingredients will help to relieve constipation, a sluggish bowel, poor fat and protein digestion, and help to cleanse and detoxify the GI tract, as well as restore normal bowel rhythms while traveling. Californian buckthorn, the tree from which casacara bark is derived, grows on the US west coast and has been used by indigenous peoples as a herbal remedy for eons. As a stimulant laxative, it works by causing the muscles in the intestines to contract. The chemicals in the bark on the other hand, cause the bowel to work. Yellow dock root is a super detoxifier, while triphala promotes healthy digestion and nutrient absorption. Oregon grape root helps neutralize stomach acid, so will stem any reflux as a result of not being able to eliminate waste. Licorice root does the same and also soothes the stomach in conjunction with ginger, an anti inflammatory. One serving equals two capsules. The manufacturer isn’t very clear as to what an appropriate dose is but it should logically be safe to take one serving (2 capsules) per day. As this is meant to be a gentle cleanse, you should not experience too much erratic, pressured bowel expulsion at highly frequent intervals. It makes sense to take the capsules at night so your bowel can move in the morning. If you’re pregnant, clear use with your doctor first. 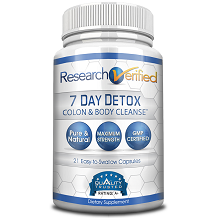 You’ll pay $19.95 for a bottle of 45 capsules, which will last you for 6 weeks if you use Colon Clean on a continuous basis. If you order 3 bottles on the 7 Lights website, you’ll qualify for the bulk offer. In terms of the bulk offer, you’ll only pay $13.37. Provided that you have purchased the bottle online from the 7 Lights online store, and have not opened the product or used it, you will qualify for cover under the company’s return policy. New, unopened items can be returned within 30 days of delivery for a full refund. This means you cannot return the capsules on the basis that you have tried them and they are not proving to be effective for you. 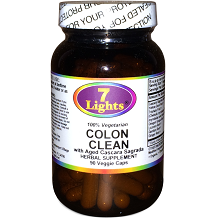 This blend of natural herbs and ayurvedic digestive remedies should, as 7 Lights states, provide a mild and gentle but effective cleanse that is fast, and leads to better nutrient absorption. As a result, immunity should gradually improve, bloating should cease and there should be a marked reverse in lethargy. It also works to detox the blood. However, it is a fairly expensive remedy to purchase without the safety of a guarantee in place. In addition, while the cleanse should be effective without irritating sensitive GI tracts, there is little in the ingredients to actually replenish lost nutrients and regulate the bowel environment long term to stop it from becoming a breeding ground for bacteria, fungi and infections long term. If this is what you’re after, go for a two-stage cleanse which also includes probiotics. If improper digestion all round is your problem, seek a remedy containing digestive enzymes among other ingredients.